Bee feeders are an essential tool for anyone interested in raising colonies of bees, though the novice beekeeper may be surprised to learn that they are not used all that often. However, bee feeders like the Mann Lake Entrance Feeder are good for beekeepers to have on hand for special circumstances. One reason a bee feeder should be used is to help a new bee colony thrive upon arriving in a new location. When you establish a new bee colony or a swarm moves onto your property on its own, the bees are new to the area and they are not yet sure where to find food. Without a bee feeder, hunger can cause many of the new bees to die out. Another time when a bee feeder is necessary is during the cooler months. Bees are smart creatures and can often take care of their own winter needs, but finding food in the winter can be a difficult task. This is partly because colder months present less food choices as many of the plants that bees typically feed on are not in season during this time of year. Another reason to provide food for bee colonies in the winter is because during the cold months, bees stay tightly in packs to keep warm. This can make their travel difficult, and they may not be able to go far to search for food like they can during the warmer times of year. Because of this, providing a food source near where the bees are staying can help their survival rate significantly. Many bees die during cold months because keeping warm is a real challenge for them. When bees in a colony die, the other bees remove the bodies from the living spaces and drop them onto a common area on the ground. A beekeeper should not be alarmed seeing many dead bees during the cold season, but they should know that providing a bee feeder can help to reduce bee casualties during hard times. Aside from these circumstances, bee feeders should not be used as a primary source of food for bees, as it is healthy and natural for bees to leave the area around the hive to go gather their own food. Though it is healthy for bees to gather their own food, every beekeeper must keep a bee feeder on hand to deal with these tough situations like new colonies or cold weather as they arise. It is important that beekeepers have a quality bee feeder available for when it becomes needed, which is why we thought it would be helpful to provide research-based reviews on the top bee feeders available on the market today. In this article, we review today's top bee feeders based on their price, their features, the time it takes to assemble them, their design quality, and pros and cons for each product. We will then conclude which is the best bee feeder available to purchase on the market today. The Mann Lake Entrance Feeder is a lightweight bee feeder, weighing in at only 0.2 pounds. It is made for easy installation right into the front of the beehive. This is helpful because it allows the beekeeper to keep an eye on the food levels without disturbing the bee colony in the slightest way. The Mann Lake Entrance Feeder works with a mason jar. The beekeeper can simply fill a mason jar with food and screw it into the fitting on top of the feeder. This allows for easy food refills. The food can be filled without opening the bee enclosure and can even just be switched out with a new, full mason jar when the previous one becomes empty. 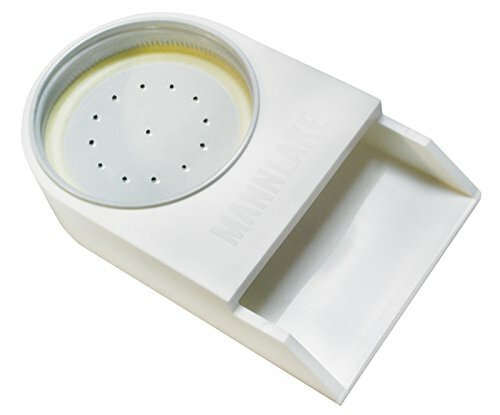 The Mann Lake Entrance Feeder is made of a durable plastic material that holds up over time, and it has been reviewed as being easy to clean, which is a major positive note for any busy beekeeper. The only negative review on these bee feeders is that they are not the best choice for extremely cold conditions. They may be better as a feeder for bees just starting in a new colony. They would also work well in areas that get cold, but don't have long, frigid winters. The Mann Lake Entrance Feeder stands out because of its lightweight yet durable plastic design that can be used with mason jars and easily cleaned. Being able to be placed in the enclosure's front is a helpful feature in the product's use. The main features that allow the Mann Lake Entrance Feeder to stand out are its lightweight, durable plastic design, its easy installation, its easy use with a mason jar, and its ability to be cleaned quickly and easily. This bee feeder has been reviewed as being extremely easy to install. You simply place it at the front of the bee enclosure. The design of this product was done with bees and beekeepers in mind. It does the job of feeding a colony of bees, but is long lasting and easy for the beekeeper to use. It could have, however, been designed in a way that allowed it to perform well during extremely cold weather. The Honey Hive Farms Boardman Entrance Feeder is another version of a small bee feeder that is made to be placed at the entrance of the bee enclosure. It again allows the beekeeper to monitor the food levels without actually opening the enclosure. This allows the bees to be disturbed less often and provides a lesser work load for the beekeeper. 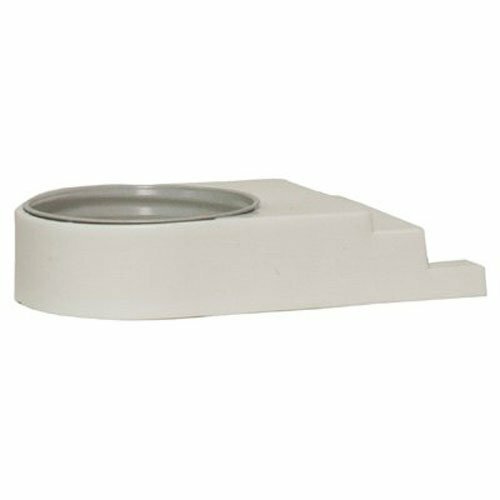 This feeder is made to work with an inverted glass to hold the food, but unfortunately, this glass piece needs to be purchased separately. The Honey Hive Farms Boardman Entrance Feeder offers the ability to check food levels without opening the enclosure as well as being small and lightweight. This product has been reviewed as being very easy to install in the bee enclosure. This bee feeder has a good overall design, but it is an inconvenience that the food holder it needs has to be purchased separately. The Toughtimbers Entrance Bee Feeder is a heavier bee feeder made of solid wood. It works well with one-quart glass jars. It also sits at the entrance of the bee enclosure and can therefore be checked without opening the entire enclosure, saving beekeepers from an extra step of work. This bee feeder comes with a cap to fit between the one-quart glass jar and the feeder itself, and extra caps for this purpose can be purchased separately. This bee feeder is unique because it promotes its use for all seasons, and when it's not being used as a feeder, it's a great way to provide fresh water to a colony of bees. The features of this device allow it to not only perform well as a feeder, but also as a water source for bees when an additional food source is unnecessary. The Toughtimbers Entrance Bee Feeder has been reviewed as being very easy to install. The design of the Toughtimbers Entrance Bee Feeder is perfect for its dual-purpose functionality. It is a heavy device, however, which may be an inconvenience to some beekeepers and possibly cumbersome in the hive's entrance. The Harvest Lane Honey FEEDBB 102 Entrance Feeder is very similar to the Mann Lake Entrance Feeder. It is made of a durable, lightweight plastic, and it uses a mason jar to hold the food it dispenses. It sits at the front of the enclosure so that the food levels can be checked without opening the enclosure. It is also not the best feeder to use in colder climates. 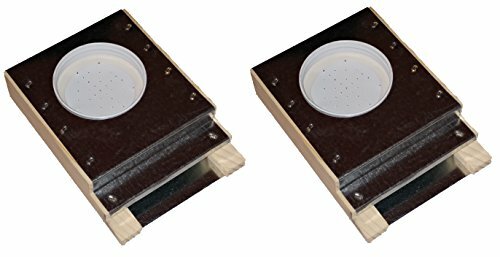 The main difference between these two bee feeders is the price. The price of this feeder is slightly more expensive than that of the Mann Lake Entrance Feeder. This bee feeder is lightweight, can be used with a mason jar, and can be checked from the outside of the enclosure. These are all features that provide ease of use to the bee-keeper. This bee feeder has also been reviewed as being very simple to use during the process of installation. The Harvest Lane Honey FEEDBB 102 Entrance Feeder was designedwell, as it can easily be used by both the bees and the beekeeper alike. However, it could have been designed to perform in cold better in cold weather. After looking into the Mann Lake Entrance Feeder and its competition, it's clear that there are many factors to take into consideration when choosing the right bee feeder for your enclosure. Since we know how important bee feeders are during the cold months and when establishing a new bee colony, making the right decision is an important task. We believe the Mann Lake Entrance Feeder is the best option for an entrance bee feeder available on the market today. After reviewing it and its competition in great detail, we feel comfortable ranking this bee feeder with five out of five stars. We base this ranking on many factors, including how easy it is to use the Mann Lake Bee Feeder, its design features, and its price. Beekeepers have enough responsibility as it is, so adding a complicated feeder to their responsibilities doesn't make sense. This bee feeder is simple to install and the beekeeper can monitor the food levels from outside of the enclosure. It is also usable with mason jars. Mason jars are a household staple that most beekeepers probably already own. 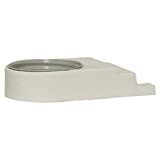 They are easy to clean and easy to switch out when food refills are required. Our high review is also based on the product's design. It's lightweight, making it easy to leave on the enclosure for any period of time. It is also durable and long lasting, so a beekeeper can trust its ability to continue feeding the colony day after day. We hope that our research and reviews have helped you in the important process of choosing the right bee feeder for your enclosure. We understand how important bee feeders, and having the correct model, is for a bee colony, and that is why we recommend the Mann Lake Entrance Feeder for your colony's needs.